So creamy with a hint of piquant umami! Usually I’m all about the quick and easy recipes, like my Easy Tex-Mex Potatoes or my Easiest Ever Orange Crush Slushie. Every now and then though, I share a recipe that might take a bit longer, but is worth it! 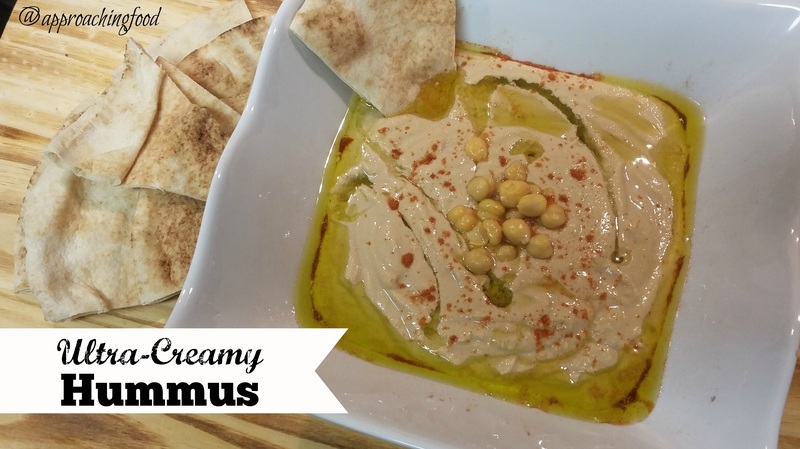 This Ultra-Creamy Hummus recipe is one of those recipes! It actually doesn’t take that long, as I just dump all the ingredients in the blender and zap it and it’s done, but getting the main ingredient ready, well that’s another story! The secret to this hummus? PEELED CHICKEPEAS. I know, I know, when I first came across the concept, I was all huh? Peeling chickpeas? Can chickpeas even be peeled? But it refers to removing the cellulose-based ‘skin’ on the chickpea. It’s that cellulose skin that makes hummus so grainy, and removing it makes the hummus ultra-creamy and smooth. Peeling chickpeas is one of those tasks that you just can’t hurry. You can stand at the kitchen sink with the chickpeas in a bowl of water, and just zen out removing them one by one. As one of my friends said, it’s actually a meditative task. It forces you to slow down and calm down and just be in the moment. I don’t always peel my chickpeas, but when I do, I definitely feel more peaceful! So, try it yourself! Peel those chickpeas and give yourself a few minutes of zen! The extra step in this recipe makes the finished product ultra-smooth and extra creamy! Rinse chickpeas and peel off skins. Throw away skins. Place chickpeas in blender along with rest of ingredients and blend. If you like thicker hummus, use less water, or none at all. Make it to your specifications! I used canned chickpeas because I just find it easier, but you could also boil your own. And, as I said, you don’t have to peel the chickpeas. It just makes the recipe that much creamier! 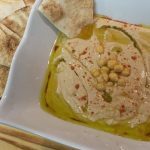 I serve hummus with veggies sticks and pita, as that’s how I ate it growing up, but it would be lovely served with some fresh falafel or tabbouleh salad! You do you, boo! This entry was posted in Vegetarian Side Dishes on February 4, 2019 by Margaret. I gave this recipe a try today and it was delicious. Figuring out how to peel the peas was not easy. I didn’t realize you must cook them first and kept walking past them trying to peel them as they soaked for two days. Finally, I gave up and cooked them and as if by magic, the skins fell off as I rubbed them! I didn’t have any tahini in the cabinet so I added more garlic. Made sense to me. No such thing as too much garlic. Next time I will buy some tahini and use it but I liked it the way it turned out. Plus, it was much better than any I have bought at the store. I was surprised by how creamy they were without the peels. The store brand I buy is creamy, which is why I liked it better than mine, but I wonder if there is a factory machine that removes the skins? There must be an expensive machine being used because it was much cheaper making my own. No, I didn’t find removing the skins meditative but considered it tedious. Next time I will drag the computer to the table and watch cat videos on youtube.